With only 2 episodes left this season – 3 considering the finale is 2 episodes in one – the third season of Once Upon A Time is coming to a close; and it just keeps getting better. The first half of this season – as well as the second half of the second season – trailed off a little bit from the wonder that was the first season. Characters that started to become a little one dimensional – like Prince Charming and Snow White – have become not only multi-dimensional again, but also very entertaining. Although all this amazing character development can’t prepare our heroes for the wickedness that is Zelena. We’ve seen many villains on Once Upon A Time, but I have to say Zelena is just awful! Now when I say ‘awful’, I don’t mean poorly written, because Zelena is an amazingly planned out character, made only more chilling by Rebecca Mader’s brilliant portrayal of her. She is just downright . . . well . . . Wicked! We’ve seen evil in Regina and Rumple, but then learned about their pasts and saw how their evilness was born out of losing someone close to them, which eventually lead to them being redeemable. Cora somewhat fit into this grouping too since she wanted what was best for her daughter – even at the price of her own daughter’s happiness. On the other hand, Pan introduced something new. He made us feel uncomfortable and we hated him because he was someone who refused to grow up and wanted to force his perverted view upon everyone just so he could live out his days. Zelena is the culmination of these two types of evil, and thus creates something completely different – Wicked. The story of how Cora was forced to give her up because of Princess Eva is tragic and how Zelena grew up with a drunkard father also pulled at our heartstrings a little; however, Zelena’s mother was kind. There was good in Zelena. When her father called her ‘wicked’ it was out of fear and misunderstanding. Zelena was a pure, kind-hearted girl, but in the end her Envy overwhelmed her and she became the very thing she was accused of: wicked. Now, she wants revenge, and no one is safe from her wrath. We learned in this episode that Glinda the good Witch knew Zelena and tried to help her with her magic. This places their meeting sometime after Zelena trained with Rumple, and thus means Zelena had another chance to find happiness. Though in the end, she just couldn’t let go of her envy. Zelena – despite some hardships – did have a good life, and an even brighter future. Instead of seeing her potential and creating a new life for herself, she dwelled on blaming others for her past. A tragic story for sure, but only because she is her own worse enemy, not those around her. We might start feeling sorry for her, but those feelings are quickly replaced by fear when we see just how much her rage has blinded her. That rage was front and center this episode as Zelena threatened to kill child and others in order to accomplished her goals. Again, bravo to Rebecca Mader for her portrayal of Zelena. We don’t just feel with the character, but also fear what she feels. 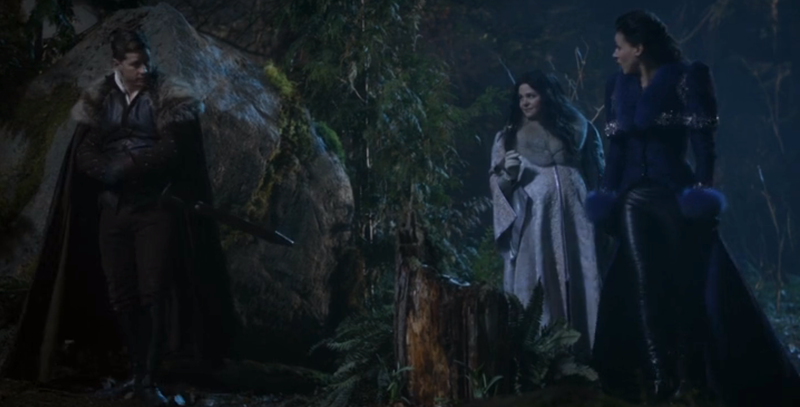 Meanwhile back in the Enchanted Forest, our heroes are learning just how dangerous Zelena is. While preparing to announce their upcoming child, Snow and Charming learn that Rumplestiltskin is alive and Zelena is now in possession of Rumple’s dagger. Aurora and Prince Phillip – who are also in attendance – reveal to everyone that Zelena is after Snow and Charming’s baby and that she threatened to hurt them and their own child if they didn’t tell Zelena when they returned. As if on cue, Zelena appears and turns Auroa and Phillip into flying monkeys for spilling her secret and then freezes everyone else as she inspects Snow’s growing child. Once Zelena leaves, they realize that their only help is to find Rumple and ask for help – just as they did when Regina threatened them years ago. With some help from Belle and Robin Hood – whom is still quarreling like 5 year olds with Regina – the gang find Rumple indeed alive and a bit ‘mad’ now that he has two voices inside his head. Rumple sends them to find Glinda who has been banished behind a magic door on the other side of the Dark Forest. For those of you who watched Once In Wonderland, the ‘door to nowhere’ idea will seem very familiar. 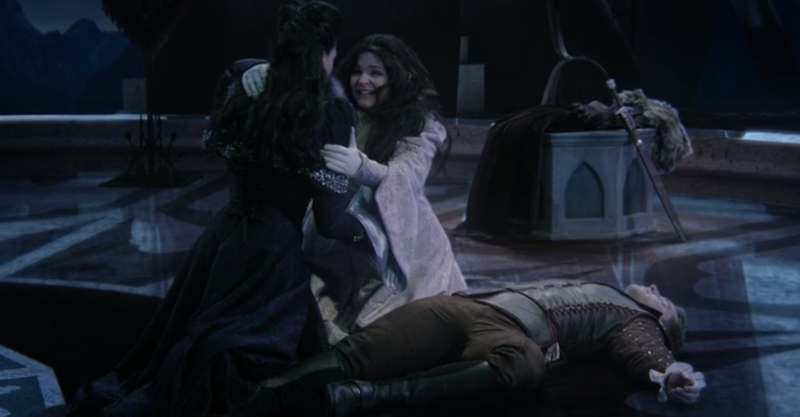 This scene is also fun because of Regina’s reaction to Snow and Charming picking flowers while on a mission, but the true purpose is revealed once they meet Glinda. Glinda, the Good – and extremely beautiful – Witch of the South is portrayed by guest star Sunny Mabrey; and informs our heroes that she and Zelena were friends in Oz, but Zelena’s envy won in the end. The only way to stop Zelena is to remove her necklace, which has become the focus and thus center of her powers, but only a light magic user stronger than Glinda can accomplish this task – but who? If anyone possesses stronger Light Magic than Glinda, then it has to be the product of true love; and no one’s love was truer than Snow White and Prince Charming. Emma is their only hope of stopping Zelena, but how can they get her? After Regina destroyed her last curse, it set up a border between their worlds. The only way to break that wall is by recasting the Dark Curse. But how? In order to enact the Dark Curse, you must sacrifice the heart of the thing you love most. For Regina that would be impossible since the thing she loves most is Henry. The only way the curse can be cast is if Snow White uses Prince Charming’s heart for the spell. Sadly, after crushing his heart, Zelena appears and “spices up” the curse with a forgetting potion. Convinced she’s won, Zelena flies off knowing that Snow will waste too much time in the new world searching for her beloved Charming to even know who Zelena was. Thankfully, Snow rememeber what Charming says about them being of one heart and decides to take it quite literally and instructs Regina to rip her heart out and divide it in two, so that both she and Charming can live. 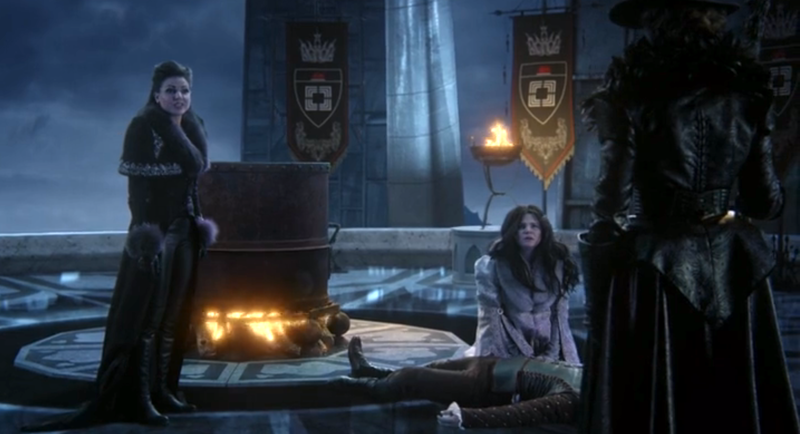 This scene also explains away the inconsistencies of thinking Zelena recast the Dark Curse. As we learned in a prior episode, the only way she could cast it would be to sacrifice Rumple – which is why Rumple ditched her as a pupil in the first place. There was nothing Zelena cared about enough to make her able to cast the curse so it makes perfect sense that someone else would have had to cast it. Good writing Once Writers! Good writing! Back in Storybrooke, our heroes are less concerned with who re-cast the curse and more with how to break it and get their memories back. Since the last curse was broken by true love’s kiss between mother and son, the solution lies in Henry remembering and then Emma kissing him on the forehead just like last time. Though unlike last time, it wasn’t Emma whos kiss broke the curse, but Regina’s. This is actually an amazing turn of events. If it was Emma again, then things would seem way too repetitive and it’d honestly start to make everyone else seem pointless if Emma is always the one to save the day. Though thankfully, the writers knocked it out of the park with this one and instead gave the honor to Regina to break the curse – thus putting her on par with her once nemesis in terms of saving the day. In fact, the best thing about this half season is how much more important Regina is. While everyone is celebrating the curse being broken and the day being saved, Hook is in trouble. Zelena let slip that he was working for her and her threatening of Henry was all his fault. Hook later explained to Emma that Zelena wanted him to kiss her and take her powers, but he couldn’t. So he decided to try to protect Henry. Charming and Snow then add fuel to the fire and reveal that they weren’t the ones who recruited Hook – it was actually Neal as we learn through a flashback. Even though Emma is being kind of harsh on Hook, I don’t understand why he didn’t tell any of them about his situation. He wasn’t going to kiss Emma so telling them would have just led to the same outcome in the end. He had multiple chances to tell them – possibly covertly – but he didn’t, so now he’s in trouble. Thankfully, there’s a much bigger blossoming romance taking place. Even though they bicker like 5-year-olds in the Enchanted Forest, Robin and Regina are getting along amazingly in Storybrooke. Early in the episode, we saw Robin and Regina kissing and he asks her what it’s like to not have a heart – since Zelena stole it. Robin then follows this up with saying that she can always share his heart. As adorable as this is, it actually serves a much bigger purpose than just being romantic. Robin’s line actually brings up a great parallel to/foreshadows what happens at episodes end with Charming and Snow LITERALLY sharing Snow White’s heart. Sometimes we get so caught up in Emma and Regina’s competive dynamic, we forget that Regina’s counterpart is actually Snow White. To see these book end moments of this episode not only reframe that Regina & Snow dynamic, but also gives us a very satisfying feeling that these two can both be living out their happy endings. Although, how long will their happy endings last? The baby is on its way and that means Zelena is going to be making an all out offensive on that delivery room. We can see from the preview of next week’s episode that Zelena makes her way through the hospital defenses and will stop at nothing to claim that child for her plan.